Dry skin + winter + furnace heat = even more dry skin! Lately when I've been applying foundation, I just look so dry! I'm not sure what it is because I use pretty moisturizing products, and when I'm not wearing makeup, my skin doesn't feel dry and looks moisturized. The primers I use don't really help, exfoliating before doesn't help, if I use a dewy foundation, I still look dry, but greasy.. how does that even make sense!? I decided I needed to try a face oil. An extra layer of moisture may do the trick. Even adding a few drops to my moisturizer or foundation when I apply it would help! So I went on a quest to find an oil that I could use. 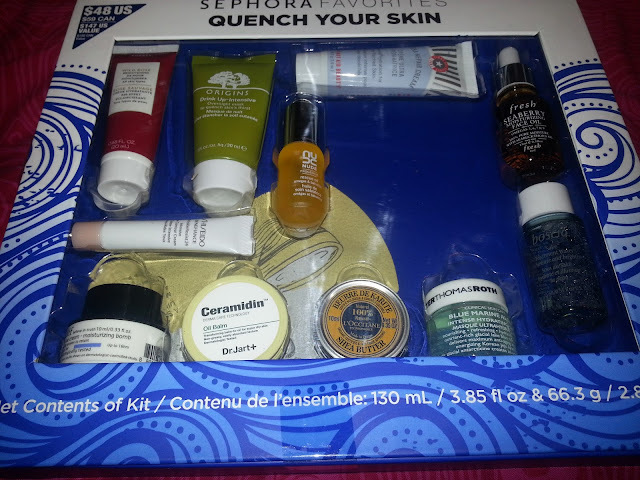 Now on that quest, I looked on Sephora's website, and I found this "Quench Your Skin" value gift set. I decided instead of investing in a larger bottle of facial oil, I would purchase this value set and maybe find something great I would have never tried before. This is the kit itself. In the top left hand corner, it says it is $48US/$59 Canadian.. with a value of $147US ($180 Canadian!) ... Again, I only really ordered this because of the Fresh Seaberry Facial Oil (it has lots of good reviews and recommendations) and the smaller size was sold out. I wasn't ready to invest $60+ in a larger bottle if it's not going to work for me. 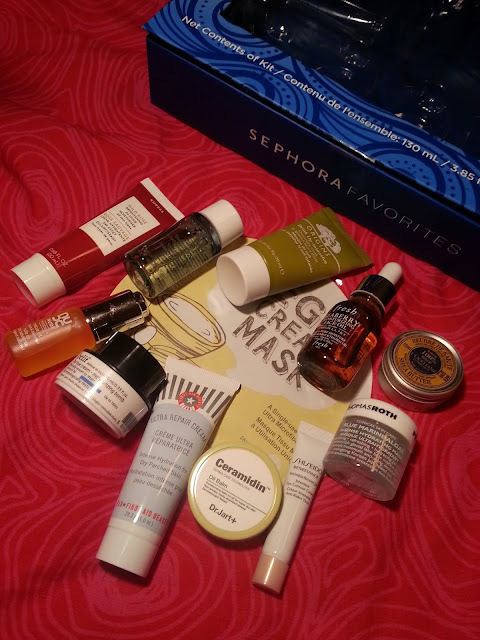 Luckily, the smaller sized bottle that was showing sold out, is included in this set, and I get 11 other sample items to try out.. for pretty much the same price as the larger facial oil. I count this as a win, because there are some exciting looking products in here! As you can see, there's a fair bit of variety in here, so let's take a closer look at everything! Full size is 1oz. Regular price is $85 Canadian, but on sale right now for $68 Canadian. An ultra-sheer, skin-saving oil that instantly revives and smooths texture while providing powerful antioxidant protection. Progenius Omega Treatment Rescue Oil is an all-natural, featherweight formula featuring bakuchiol—nature’s answer to retinol without the negative side effects. It helps repair and refine texture for satiny, flawless-looking skin. Coleus root and organic rosemary extracts, nature’s best purifying ingredients, work to clarify the complexion. A potent botanical complex boosts skin moisture, and virgin, organic, cold-pressed rose hip oil nourishes with omegas 3 and 6 and vitamin C. Antioxidant-rich ingredients provide environmental protection, making this a true lifesaver for everything your skin faces on a day to day basis. This oil also has some decent reviews, and I decided to pull this one out first and put it to the test. It's only been a few days so I will get a full review up once I feel I have tried it long enough! This does have a little bit of a scent to it, which reminds me a lot of the Dr. Jart ceramidin products. It's not overpowering though. 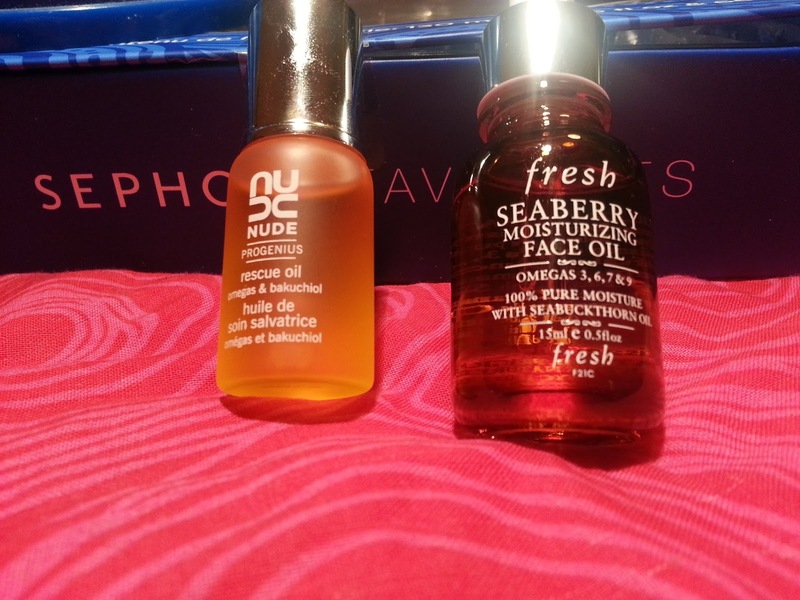 Fresh - Seaberry Moisturizing Face Oil - 0.5oz is $22 Canadian, Full size (1.6oz) is $63 Canadian. A soothing face oil packed with restorative omegas and seabuckthorn oil to preserve a youthful appearance. This oil came to me as the most recommended. It also has some good reviews! I can't wait to give this one a try! This also has a slight herbal scent, but I can't see it bothering me. Korres - Wild Rose Brightening 24-Hour Moisturizer - this can only be found on the US Sephora site, which is kind of sad if I end up loving it! Full size is 1.35oz for $38 USD. A cream that moisturizes and brightens the skin. This cream is formulated with a range of ingredients that moisturize and brighten the complexion. Wild rose oil, a natural source of vitamin C, helps repair the look of fine lines and skin discolorations. Imperata-cylindrica extract, derrived from a desert plant, is known for its ability to provide continuous moisturization by regulating the moisture equilibrium of the skin. This has a light scent of roses, but I can't see it being irritating. I'm a little sad that this can only be found on the US site, because that's not really good to us Canadians. Anyway, it feels a little thicker, and apparently can look a little greasy if you apply too much, but either way, I'm still excited to try it. 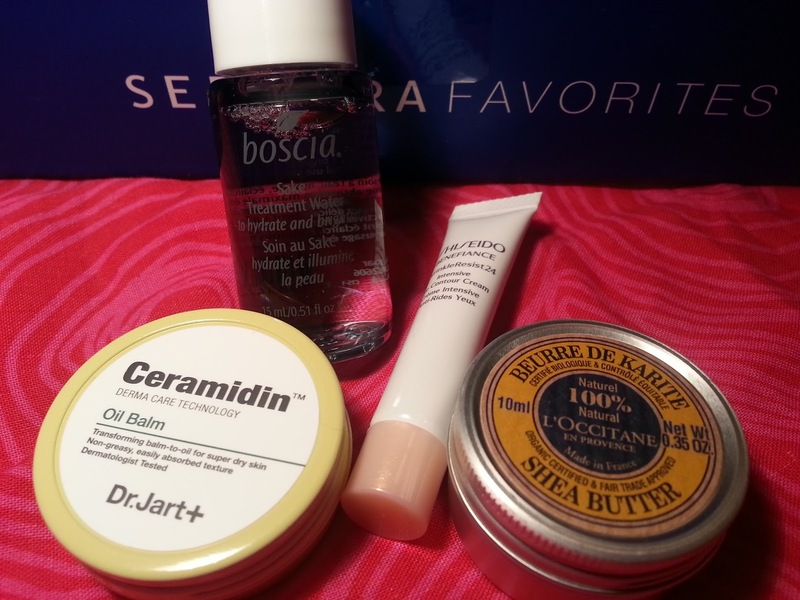 Rose products are generally good for people with dry skin! A super-emollient cream with a spectacular whipped, non-greasy texture. This Ultra Repair Cream Intense Hydration is a thick, rich, emollient product that hydrates deep down with exceptional penetration. This cream is for anyone with severely dry, scaly skin due to harsh winter weather, aggressive cosmetic treatments, or any of the following conditions: atopic dermatitis, irritant eczema, allergic eczema, and keratosis pilaris. With the help of colloidal oatmeal, shea butter, soothing eucalyptus oil, and ceramides, Ultra Repair Cream Intense Hydration provides immediate relief and visible improvement for distressed skin. The FAB Antioxidant Booster defends skin from free radical damage and the cream deeply hydrates with exceptional penetration, providing immediate relief and visible improvement. The cream is immediately absorbed into the skin and can be used all over the body and on the face. I've used this in the past and I wasn't a fan of it. It never really absorbed into my skin, and it would ball up if tried to put anything on top of it. I think it may have even broken me out a few times. It turned into a hand/body lotion for me. So that will probably happen again with this one. Another US Only product. Hmmm. I have heard amazing things for this and when swatched on my hand, it really does feel moisturizing! This is another product I really can't wait to try! A milky, serum-enriched microfiber sheet mask infused with egg white and egg yolk extract to instantly hydrate for a bright and radiant complexion. This hypoallergenic microfiber sheet mask is infused with egg white and yolk extracts to help clarify, nourish, and moisturize skin. It helps firm skin for a younger-looking appearance while removing dead skin cells for a beautifully clean and smooth finish. Featuring a comfortable fit and a silky-soft touch, simply remove the mask after 10 to 20 minutes to reveal a luminous, radiant glow. I have seen these Egg Cream Masks on so many Korean Beauty pages, and I have never ever picked one up to give it a try. I love the sheet masks in general, so I will probably enjoy this one. However, I'd look for a deal from a Korean seller because I'm sure they are less than $8 each! 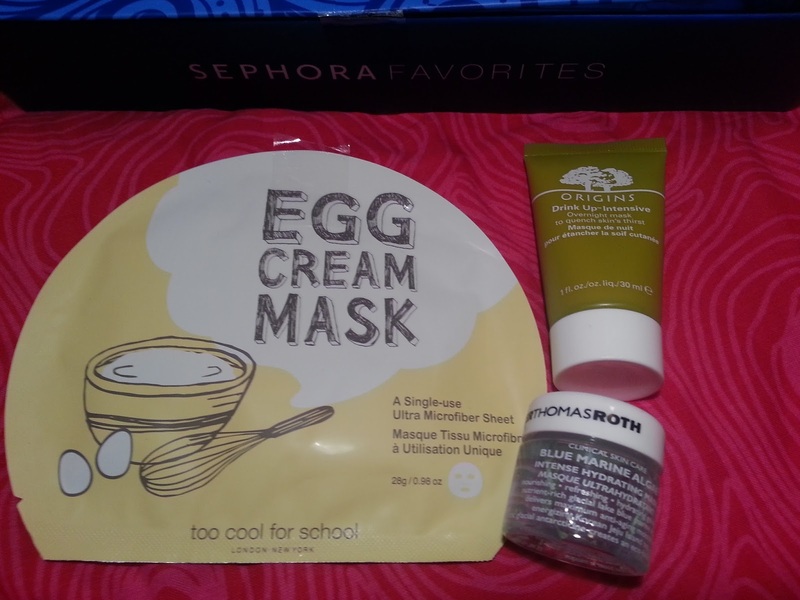 And if not, I probably won't ever repurchase just because a $2 mask would work just as well. Ahh, this moisture mask says to apply it only twice a week or as desired, and to massage onto clean skin and tissue off excess. Is this necessary? I thought it would be more like a sleep pack and you just sleep with it on? Anyone have experience with this particular mask? Please let me know what you did with it in the comments! A nutrient-rich hydrating gel treatment mask that helps soothe and nourish skin with blue marine algae and other potent humectants. Blue marine algae is a nourishing seaweed that infuses skin with nutrients and humectants to help defend against dehydration and prevent future damage. Antarcticine—a unique glycoprotein sourced from Arctic glacial ice—helps skin retain water and protects against water loss in extreme climates or temperatures. Sourced from the Jeju Islands of Korea, tea delivers deep nourishment and abundant moisture. Skin is left instantly hydrated and smooth with a healthy-looking, dewy glow. Over time, as the treatment balances skin’s hydration levels, fine dehydration lines are visibly diminished. This is a rinse off mask - which I don't use too often, but I'm definitely looking forward to giving this a try - even if it does say it has algae lol. I call this section random because there's only really one of each item, and they don't really fall into the other categories! An innovative, sake-infused, Treatment Water that hydrates, brightens, and preps the skin for maximum absorption of treatments, serums, and moisturizers. Sake Treatment Water allows for greater absorption of skin care products. It is rich in vitamins and minerals that deliver powerful hydration and brightening benefits to the skin. Formulated with the finest sake grade to deliver powerful hydration and brightening benefits to skin, it works to revive the skintone and texture while it primes the skin. I'm not entirely sure where you use this in your skin care routine. Is it like a toner that you use after cleansing face and before applying your ritual? Or is this used inbetween steps? Again, someone let me know if they've ever tried this and when you use it in your routine! Please! Edit: I checked the q&a section on Sephora and this is supposed to be used as an essence.. good to know! I have the ceramidin cream, and I find it does nothing for my skin. 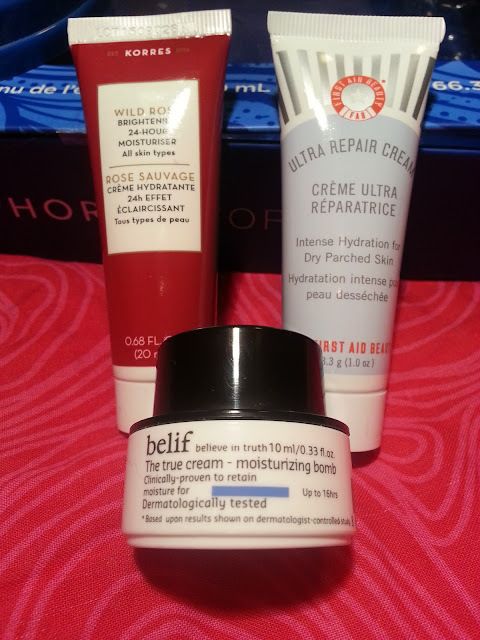 I will try using the balm with it to see if it has a better effect on my skin. I've never used an oil balm as a moisturizer before, only to remove makeup, and this doesn't look like this is for that. An ultrarich, age-defying cream that visibly improves the appearance of all types of eye area wrinkles. This advanced treatment addresses signs of aging in the eye area, including inner corner creases, undereye wrinkles, crow's feet, lid creases, and undereye vertical lines. The WrinkleResist24 signature ingredients prevent future wrinkles and repair existing wrinkles. I usually love Shiseido, so I hope I love this eye cream. However, I'm not a fan of the price tag. This sounds like a great multi-tasker. I will have to give it a try on some dry spots! So as you can all see, you get a large amount of products, and the value is really there in this set. I'm really looking forward to trying a few of the products, and hope that some of these can replace some of the items I'm using now, that I'm not entirely happy with! Once I start using them more, I will put up some more reviews that focus on the one item at a time. I hope my skin enjoys all of these new (to me) moisturizing products! I think you made a good choice with trying out the variety instead of going all in on one product. There are so many great products in here! I hope you find some that work for you. What an excellent and thorough review! I've had this item favourited for a while but hesitated to get it, thanks for this helpful info!